I've been busy making up some test print plates today by etching and burning into plastics. After I had tidied up all my materials I took a couple of the test papers I had been printing on and created some small drawings, this image of two figures is one of them. 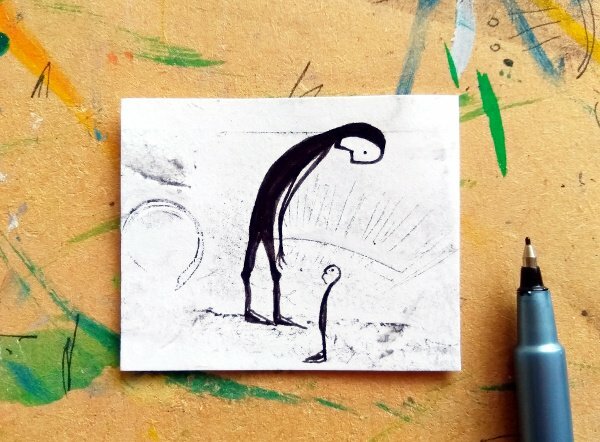 A tiny pen drawing on a tiny print. I love your creativity, @opheliafu. When at university we saw the factors to be taken into account in communication, one of the things we were talking about was the position we should have with the other, with the receiver. When we talk to children, we take that position to be closer to them, "to be at their level. I like the concept of equality that you use here, kinesthetic. The other me that we always talk to, another one just like us. I love it! Those words feel very true to me. I like the idea that this giant has stopped what she is doing to turn and look at the figure next to her. The smaller figure looks inquisitive, maybe the giant will help them find the answers.